Every few years a business change appears that is presented as a quick fix to make business organizations highly productive. These have included process re-engineering, total quality management and matrix management, all without long-term success in either the for-profit or nonprofit sectors. However, entrepreneurship, which some directors may see as “the trendy fix of the month,” needs to be given serious consideration. 1. Focus on collecting knowledge about the nonprofit. As part time stewards, most directors will never have the knowledge level management has about the nonprofit’s mission and its field of operations. As a result, directors have an obligation to seek information from a wide variety of sources, not from management alone. In the 21st century this means that occasionally individual directors may want to meet with key persons below the management level. Some management purists will bridle at this suggestion, but it is also a part of an effort to improve organizational communications and transparency. 2. Focus on people development. Nonprofit directors have an obligation to plan for management successions. The board has to be certain that somebody is available to assume the CEO position in the event he/s is temporarily or permanently incapacitated. Also the board has to make certain that high potential staffers have opportunities to develop their management skills, so that promotable persons can be identified, when needed. 3. Networking is very important. 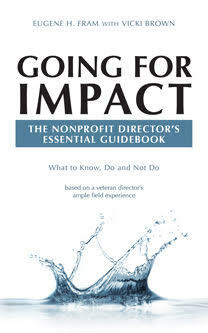 Where possible, network with directors of similar types of nonprofits. Attending a field conference or a local meeting can help a great deal. If it is not seen as being too proactive, ask the CEO, via his peers, to arrange informal meetings with board members of similar organizations. These meetings may even lead to venues for the two organizations to partner in an effective manner. 4. Always look past the messenger and focus on the message. On most nonprofit boards, except if those that are moribund, there are directors who become the proverbial burr under the saddle. However, from time-to-time, such directors, if they are not perennially disruptive, can provide some unusual insights. 5. Always work on what will be next. Nonprofit boards have an obligation to make sure forward-looking strategies and policies are in place. Mission success today does not mean that it is assured for tomorrow. Too many environmental social and technological changes are taking place quickly. Example: To what extent will the need for psychological mental health therapies eventually be supplanted by new drug regimens? This is a serious question for nonprofits offering the former service. 6. Learn by mistakes. No organization or person does a job perfectly. Nonprofits have an obligation to take reasonable entrepreneurial risks to improve clients’ services. Risk-reward thinking must permeate the DNA of nonprofits. Some foundations may be able to support a portion of the risks involved. 7. Turn ideas into actions. In the sales field an old mantra is, “ Nothing happens until a sale is made.” Similarly nothing happens in the nonprofit environment until some action is taken on a proposal, even if it is controversial. The action may only be experimentation or in-depth investigation. Lacking these actions, organizational analysis-paralysis takes over. Entrepreneurship is not often included in the nonprofit directors’ vocabulary. If nonprofit directors apply vetted core business principles to their compliance, over-viewing and strategic responsibilities, entrepreneurial results can be achieved that significantly support the mission. ← How Often Do Nonprofit Board Members Need to Question Strategic Norms? Casey: Thanks again. LinkedIn has restricted, by automated algorithm, what group viewers receive. Consequently my post viewer numbers have dropped from some at over 500 levels to the 100-200 levels. Protested but it didn’t do any good. Hope all is well with you.